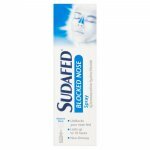 Sudafed Decongestant Liquid is a medicine which is used to provide relief from the symptoms of blocked nose or sinuses and catarrh associated with colds. 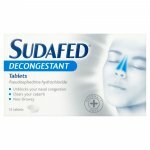 The syrup contains pseudoephedrine hydrochloride, which is a decongestant that relieves nasal and sinus congestion. It’s normal for children to get 8 or more colds in a year. Because colds are caused by viruses, not bacteria, antibiotics don’t help. Here are simple steps to help your child who has a cough or cold. If they are hot/feverish: Increase the amount of fluid your child normally drinks. Lower their temperature with a paracetamol or ibuprofen medicine which has doses for children. For coughs: Coughing serves a purpose, it helps clear phlegm and mucus. Give the child plenty of warm clear fluids to drink. To help with breathing: Plain saline nose drops/sprays can help with blocked noses. Always shake the bottle thoroughly before use. Do not use more than the stated dose shown in the table. Do not overfill the spoon. There is a double-ended spoon in the pack. Take one large 5 ml spoonful every 4 - 6 hours, up to 4 times a day. Take two large 5 ml spoonfuls every 4 - 6 hours, up to 4 times a day. If symptoms persist or worsen talk to your doctor. If anyone has too much contact a doctor or your nearest Accident & Emergency Department (Casualty) taking the leaflet and pack with you. If you forget to take a dose, take the next dose when needed provided that the last dose was taken at least 4 hours ago. Do not take a double dose. If you have ever had a bad reaction (e.g. 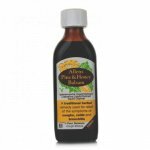 rash, swelling of the face and throat, difficulty breathing) to any of the ingredients. If you have a phaeochromocytoma (rare tumour that affects your heart rate and blood pressure). For children under 6 years old. 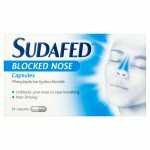 If any of these apply to you, get advice from a doctor or pharmacist without using Sudafed Decongestant Liquid. If you have been diagnosed with an intolerance to some sugars. If you are not sure about any of the medicines you are taking, show the bottle or pack to your pharmacist. If any of these bullet points apply to you now or in the past, talk to a doctor or pharmacist. Ask your doctor or pharmacist for advice before taking any medicine in pregnancy or whilst breast-feeding. Each 5 ml of this medicine contains 3.5 g of sucrose. This may be harmful to your teeth. This should be taken into account in patients with diabetes mellitus. If you have been told by your doctor that you have an intolerance to some sugars, contact your doctor before taking this medicine. Methyl hydroxybenzoate may cause allergic reactions such as skin rash; this may occur after a few days. The colouring Ponceau 4R (E124) in this medicine may cause allergic reactions. Allergic reactions including skin rashes (which may be severe and include blistering and peeling of the skin) and itching. 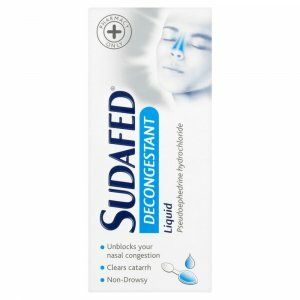 Allergic reactions to other medicines containing sympathomimetic drugs (stimulants or appetite suppressants and drugs used to treat congestion and asthma). An increased or irregular heartbeat, an increased awareness of the heartbeat (palpitations), high blood pressure. Irritability, anxiety, excitability, nausea and sickness. Headache, difficulty in passing urine. Do not use after the end of the month shown as an expiry date on the packaging. 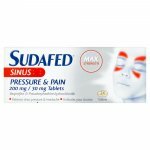 Active ingredient: Pseudoephedrine hydrochloride 30 mg per 5 ml. Other ingredients are: Citric acid monohydrate, sucrose, glycerol, methyl hydroxybenzoate (E218), sodium benzoate (E211), Ponceau 4R (E124), raspberry flavour and water.